[Jesus said,] "But while I am here in the world, I am the light of the world." Then he spit on the ground, made mud with the saliva, and spread the mud over the blind man's eyes. He told him, "Go wash yourself in the pool of Siloam" (Siloam means "sent"). So the man went and washed and came back seeing! Jesus longs to bring us his blessings. 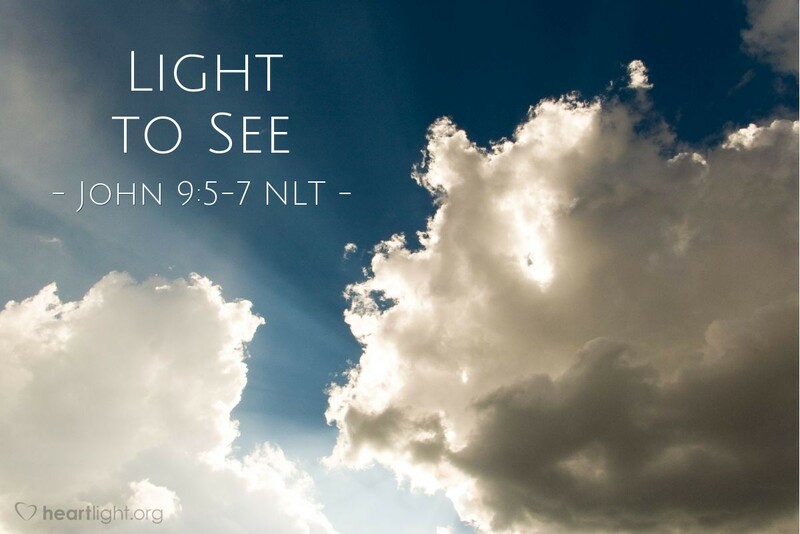 A blessing that we desperately need is the sight to see things as they are and to be able to discern Jesus' will and follow it. So often we view obedience as a burden rather than a blessing. However, Jesus wants to bless us through our obedience just as he blessed the blind man. Obeying him, doing what he sends us to do, brings a much greater blessing than any perceived burden it might entail. O gracious and generous Father, please make my heart pliable and open to your truth. Help me move from merely understanding your will to obeying it with joy and expectation. Forgive me for being reluctant to obey when I do not fully understand why you want me to do something. In Jesus' name. Amen.